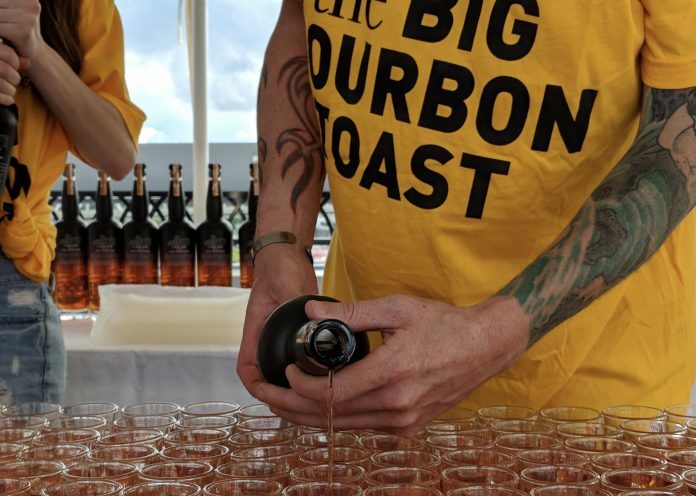 This Monday, New Riff Distilling celebrated its first-ever annual “Big Bourbon Toast”, attracting an estimated 2,200 Bourbon enthusiasts and local dignitaries. The celebration took place on the Newport Southgate Bridge, nicknamed the Purple People Bridge, which links the distillery’s hometown of Newport, Ky. with Cincinnati across the Ohio River. 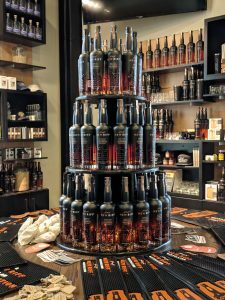 The event spotlights Northern Kentucky as a key gateway to the state’s famed Bourbon Country and newly-launched Bourbon Line (B-Line). It also commemorates Greater Cincinnati’s role as a major mart for American whiskey in the 19th century. The event also marked the official launch of New Riff Bottled-in-Bond Bourbon that has been patiently aging for four years. Ken Lewis, New Riff Distilling’s Founder, lead the attendees in a toast with the debut of the long-awaited spirit. He was joined by the New Riff Distilling team, including Co-Founder Jay Erisman, Head Distiller Brian Sprance and Consulting Master Distiller Larry Ebersold. Also in attendance were Newport Mayor Jerry Peluso, Northern Kentucky Chamber of Commerce’s Brent Cooper, MeetNKY’s Eric Summe, Judge Steve Pendry, Judge Gary Moore and other notables. The event was followed by an after-party at New Riff Distilling’s West Campus, where thousands of New Riff Distilling fans celebrated the milestone occasion. 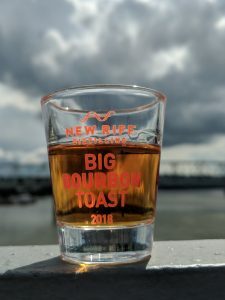 In addition to music, food trucks and a festive atmosphere, attendees were among the first customers to purchase their own bottles of New Riff Bourbon. The spirit is available for purchase now at New Riff Distilling’s gift shop with a general roll-out beginning on September 1.